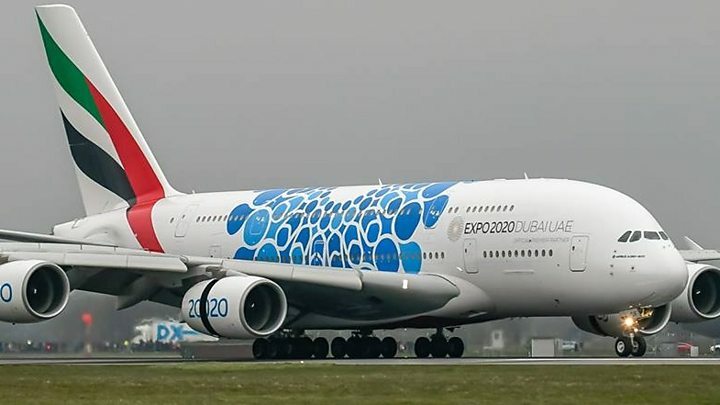 The world's largest commercial passenger aircraft has landed in Glasgow to start regular services to Dubai but bringing the superjumbo to the airport has meant big changes. More than £8m was spent to prepare Glasgow for the arrival of the Airbus A380 double-decker jet. The engineering programme involved changes to the airfield layout and the building of Scotland's only triple air bridge. It has been designed to get hundreds of passengers on and off the giant as quickly and safely as possible. If you think the arrival of an A380 at Glasgow sounds vaguely familiar, you are right. A single superjumbo visited Glasgow in 2014 to mark 10 years of flights from the city by the Emirates airline. That one-off event necessitated special safety, air traffic and security measures. Airport ground staff preceded and followed the plane to avoid mishaps. "Wing walkers" - on the ground, not actually walking on the wings - signalled to the flight deck that the wingtips would not clip the airport buildings. These are not measures that could be taken on a daily basis. And daily flights are what we will now see. In recent years Emirates have scheduled twice-a-day services by Boeing 777-300ER aircraft. But engineering works at the airline's Dubai hub are closing one of its runways and reducing the number of possible aircraft movements. So, for the time being, a single A380 flight will replace the two current Glasgow services. When Dubai returns to full capacity the A380 will be joined by a 777 for the time being. It will mean a passenger capacity of three Boeings a day, shrunk into two aircraft movements. The wingspan of an A380 is 79.75 metres - that's about the length of seven double decker buses. The prospect of regular A380 arrivals and departures led to extensive engineering works. Although it is shorter than a 777, the superjumbo is heavier - and wider. While Glasgow's runway and main taxiways could handle that already, secondary taxiing routes had to be widened and strengthened in case the plane was steered slightly off course. A maximum takeoff weight of more than 575 tonnes would not mix well with the turf at the side of the taxiways. Ronald Leitch, whose job title is the Head of Aerodrome, says width was also crucial. "What is surprisingly bigger is the wingspan - and that's 15 metres bigger," he says. "Where we've made a number of modifications is around how we protect the wings while the aircraft is either taxiing or on stand. "So we've made the stand bigger and moved it north. "Also on the taxiing network we've put in some safety measures to protect the aircraft's wings." Traffic lights and other obstacles which would have fouled the wings have been lowered to ground level. The wingspan puts the A380's two outboard engines over the grass beside the taxiways, so some infrastructure there has been moved to prevent it being sucked into the engines. Runway "hold points" have been modified because the pilot's view from the flight deck windows is different (although pilots have TV cameras on the fuselage to help them see better). Passengers are unlikely to notice any difference until the A380 taxis to its stand. As well as being moved north from its previous position, Stand 30 is now unique in Scotland. Air bridges that enable you to walk "on the level" from terminal to plane - and avoid the west of Scotland weather - have been commonplace for decades. But Stand 30 has a triple air bridge. Not one but three arms will embrace the aircraft. The economics of aviation dictate this. A plane earns money in the air but costs when on the ground. So a swift turnaround between arrival and departure is imperative. Some versions of the A380 can carry more than 600 passengers on two decks. A triple bridge speeds up the process. So does the ability to refuel the aircraft from two sides at once. Catering, baggage and waste have similar arrangements. The number of points that provide electrical power while the plane is on the stand has been doubled. Even air traffic control procedures have been changed. Normally passenger planes on the same track are spaced seven nautical miles apart. Such is the air turbulence left in the wake of the A380, that spacing must be more than doubled to 15. Stand 30 has been designed to have a dual role. When the A380 is not using it, the three arms of the air bridge can handle two smaller aircraft at the same time. Keeping all the engineering on time and on schedule, despite strict airport security, has been the job of principal project manager Roy Thomson. He has been assisted by two project engineers and a design project lead. It would be difficult for Roy to avoid bringing his work home as the last of these is his wife Linda. Tens of thousands of working hours have gone into the project, most of them managed by contractors Kier Construction. Roy says design changes have meant it has not all been plain sailing, especially because they were up against an immovable end date. Tickets for the first flight were already being sold so even a short delay was not an option. But now, as the new departure desks, passenger lounge and triple bridge have taken shape, he allows himself some satisfaction with the job. "One of the most rewarding aspects of the project is the joining of the old with the new," he says. "The positioning of the new lounge has managed to capture a panoramic view of the hills around Old Kilpatrick. "I walked them when I was a lot younger. "I always appeared to have more time to enjoy them then." The irony underlying all engineering work is that Airbus has announced it will be ending production of the A380 in 2021. This is because there were two competing visions of the future of passenger aviation. The "hub and spoke" model has large aircraft flying between major hubs such as Dubai and Heathrow, with smaller planes then carrying passengers on the "spoke" flights to smaller airports. This was the idea behind the design of the A380. Boeing and other manufacturers predicted that the future lay in "point-to-point" flights, with relatively smaller aircraft flying between smaller airports, bypassing the major hubs. The success of the latter model has slowed orders for the A380. Nevertheless, more than 250 will have been built by 2021. They will continue to carry thousands of people every day for years to come. Their size will continue to spellbind passengers - and inspire aerodrome head Ronald Leitch and his colleagues. "It's exciting, the care, the passion and the pride that all of our team at the airport have," he says. Many staff are planning to come in on their days off to watch it arrive. "Everyone wants to say they've worked on the A380," he adds.